Posted September 9, 2016 | Category: Applian Software, Product Updates, Replay Converter, Replay Media Catcher, Replay Music. Our rockstar developers pushed a handful of awesome new updates this week, focusing on improvements to Replay Media Catcher, Replay Music and Replay Converter. All of the updates you see below are live and ready to enjoy! Just update your software to get in on the enhancements. Support downloading and embedding of subtitles and cc. 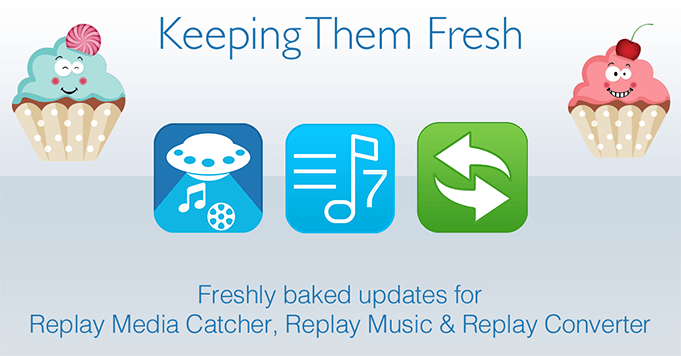 Download the latest Replay Converter. Any questions? Reach out to our Support Staff any time! I’ve used version 5 and 6 of replay music, they both had adjustable recording levels. I have a trial version of 7 and there doesn’t seem to be a way to adjust recording level. Is there a way? Hi Chris – version 7 does things a bit differently. Adjusting volume recording levels should not be necessary. However you can turn off or on Peak Normalization in Recording Settings. That should be all you need. If you have any further questions, please contact tech support and they’ll be happy to help you!